The College Farm is host to a long term bluebird monitoring and habitat enhancement project. Led by Professor Gene Wingert (Environmental Studies), students have established a “bluebird trail” throughout about 50 acres of the farm property. The project began in 2009 with extensive work performed by Environmental Science student Atandi Ayona, who served as a wildlife diversity specialist for the summer. 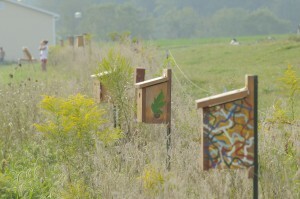 Over the years, the trail has grown to include over 75 bird houses. Boxes are made of wood milled from trees felled on Dickinson’s campus, and many of the boxes were creatively hand painted by students. Long term maintenance and monitoring of the bluebird trail has been performed by numerous students from Professor Wingert’s biology and environmental courses. Students study the interactions between bluebirds and tree swallows, and work to deter less desirable birds from nesting in the boxes. Bluebirds benefit the farm by foraging for insects in the crop fields, and they are also very entertaining to watch in flight. The bluebird trail skirts the perimeter of the vegetable farm and serves as a cornerstone to our biodiversity enhancement efforts. The bluebird project also contributes to our overall Integrated Pest Management strategy.